Kori Purdum Matheis and John Matheis recently acquired Proffitt & Associates Architects, P.C., the longtime Frederick, MD-based practice. 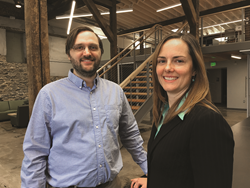 John Matheis and Kori Purdum Matheis have purchased the Frederick, MD-based architectural firm, Proffitt & Associates Architects, PC. Landon Proffitt founded the firm in 1973 when Frederick was relatively small with a population of less than 24,000–yet on the brink of substantial commercial growth. At the time there was also a growing appreciation for the county’s historic properties and the need for preservation services. Michael Proffitt, Landon’s son, joined the firm several years later and became a partner in 1981. Both father and son oversaw the design of many commercial and government buildings as well as historic renovations. In 2000, Michael Proffitt hired Ms. Matheis as an architectural designer. Ms. Matheis, a Frederick County native, had recently obtained her Master of Architecture Degree from Savannah College of Art & Design. In 2006, John Matheis, II joined the firm shortly after earning his Bachelor of Science Degree in Architectural Engineering Technology from Fairmont State University. There, John and Kori met and eventually married. In February 2017, Michael Proffitt passed away following complications stemming from a skiing accident, a loss felt throughout the community. The firm’s architectural and interior design services have grown exponentially over the past 45 years with expertise in commercial, industrial, government, education, civic, health care as well as preservation project work. In recent years, Proffitt & Associates has overseen the design of a diverse range of projects that have included the Frederick Visitor Center, Tatem Arts Center at Hood College, FCPS’s Earth & Space Science Laboratory, the East All Saints’ Street Parking Garage, the Monroe Center renovation for Frederick Community College, Catoctin Creek Park and Nature Center, and the West Patrick Street Parking Garage and City Office Annex. Current projects include the design of a new building for FCPS’s Rock Creek School in Walkersville, an expansion to the City of Rockville’s Swim and Fitness Center, two additions at St. John’s Catholic Prep, and the replacement of the slate roof at Frederick City Hall. Mr. Matheis says the firm has also been involved in the design of medical offices including facilities for FMH and other private practices on TJ Drive–noting the increase in medical services in Frederick. The firm currently has 7 employees and is licensed to serve clients in MD, VA, WV, DC, and PA. With the recent purchase of the firm, Ms. Matheis, RA, LEED AP BD+C, fulfills the role of president and Mr. Matheis, RA, LEED AP BD+C, acts as vice president.